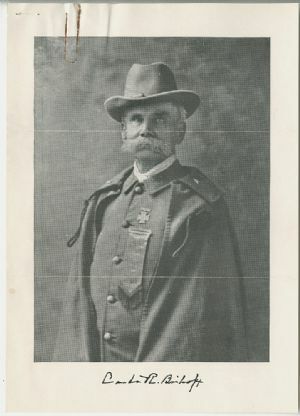 Bishop was very active in the United Confederate Veterans organization. Leaders were given rank unrelated to their actual Civil War service rank and so the Brigadier General status he reported was in the UCV. The medal was likely a veteran's medal. United States--History--Civil War, 1861-1865--Registers; United States--History--Civil War, 1861-1865--Veterans--Portraits.